Scott MacKenzie, in his introduction to Film Manifestos & Global Cinema Cultures: A Critical Anthology, points out that manifestos written by filmmakers are often marginalised from traditional narratives of film history. Cinema history is usually classified into genres, time periods, or national film industries; even auteurist approaches to film history focus on the directors' cinematic styles rather than their written delineations of those styles. MacKenzie's aim is "to outline a theoretically informed counterhistory that places film manifestos, often neglected, at the center of film history" and "to reconsider the status of the film manifesto in film theory". 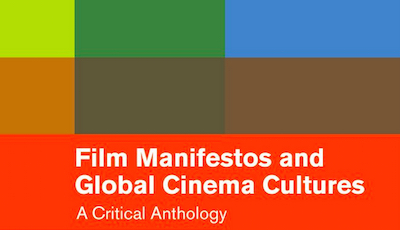 He has compiled a comprehensive and inclusive collection of film manifestos: his anthology "brings together film manifestos from the global history of cinema, constituting the first historical and theoretical account of the role played by film manifestos in filmmaking and film culture." Many of the manifestos have a similar recurring theme, denouncing the traditional film industries of their respective countries, largely influenced by François Truffaut's "deliberately pessimistic examination... of a certain tendency of the French cinema". India's New Cinema Movement manifesto states: "A reaction to the vulgarities of the established commercial cinema has been in existence for several years in many countries, crystallising in many places, into a regular, conscious movement for better cinema." Mexico's New Cinema Group called for a "new cinema in Mexico, which without a doubt will be a far superior cinema than the one today." The New American Cinema Group proclaimed: "we know what needs to be destroyed and what we stand for". The Oberhausen Manifesto put it even more succinctly: "The old film is dead. We believe in the new one." Manifestos associated with major artistic movements such as Futurism (cinema as "polyexpressive symphony"), Constructivism ("the vitality of the cine platform of constructivism"), and Surrealism ("the sexual instinct and the death instinct" in L'Age d'Or) are included alongside more obscure manifestos such as Nick Zedd's Cinema of Transgression ("We... propose to break all the taboos of our age by sinning as much as possible"). I've been collecting film and art manifestos for several years, and the book includes several that are new to me. B Ruby Rich's essay The New Queer Cinema is the only notable omission. Some of the essays are among the most famous works of film theory: John Grierson's criticism of Berlin: Symphony Of A Great City as "the most dangerous of all film models to follow", Glauber Rocha's Cinema Novo: "Our originality is our hunger and our greatest misery is that this hunger is felt but not intellectually understood", Stan van der Beek's "expanded cinema, as a tool for world communication", and Laura Mulvey's psychoanalytic study of "the way the unconscious of patriarchal society has structured film form." Collating so many key texts in a single volume is a rare achievement, and the book ranks alongside Film Theory & Criticism and Movies & Methods. My only criticism is that MacKenzie's introduction is quite repetitive: one paragraph explains that the book "brings together film manifestos from the global history of cinema" and the next paragraph tells us that it "brings together key manifestos of the last 110 years". Also, the footnotes include a surprisingly catty comment about how the Village Voice "couldn't get any worse". A few of the essays are also included in 100 Artists' Manifestos. The first manifesto anthology, Manifesto: A Century Of Isms by Mary Ann Caws, covers art movements though not cinema. Icon magazine published a Manifesto Issue containing fifty design manifestos in August 2007. Unlike some texts in other anthologies, the manifestos in Film Manifestos & Global Cinema Cultures are unabridged, with the Salamanca manifesto ("Spanish cinema is still a cinema of painted dolls") being the sole exception.